The Southwest Through Wide Brown Eyes: A Quilter Sews in Monticello, Utah. A Quilter Sews in Monticello, Utah. Since moving to Monticello in 2009, one of the hobbies I have neglected is quilting. I began quilting in 1990 when I moved to Lancaster, Pennsylvania; became a member of the Red Rose Quilters Guild and made many a creation until the move to Utah. Today though, I may have just met the inspiration to take out my needles, quilting rack, fabrics and patterns. Once a month at the Welcome Center, a Cultural/Artisan Expo is held; today's demonstration was by Marie Wigginton who is a member of the Monticello Quilters Guild. Marie was accompanied by her husband of 58 years (married in 1955), Luther; their son Tom and his wife, Linda, own Thatzza Pizza, while grandson Thomas and wife, Mandy, own San Juan Pest Management. Originally Marie and Luther resided in Casper, Wyoming before moving to Monticello only five years ago; this family didn't sit around and wait for attention, but became busy in the community. Marie considers herself a self taught quilter; she began quilting in the 1950s with her mother-in-law. After becoming adept in hand quilting, she ventured out into the world of machine quilting. 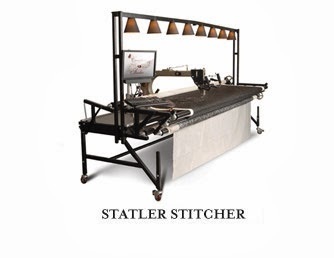 Her prized possession is the Gammill Statler Stitcher which contains approximately 1500 patterns, and can have more easily uploaded to its memory files. Being a large piece of machinery, Marie could not bring it to demonstrate on, so the photo is one taken off the internet from Gammill's website. Marie did bring one of her hoops in and set up a demonstration of her hand quilting techniques. As opposed to embroidery, cross-stitching or garment sewing which use long, thick needles; an experienced quilter is proven by the smallest needle size she can use. A size 10 or 12 quilter's needle means that there should be 10 to 12 stitches per inch of quilting. While cotton threads and fabrics are the standard, technology nowadays is creating threads and fabrics that hold up to washing and normal wear and tear that a quilt would receive. A must is a thimble; it helps to push the needle easily through the fabric, not through your finger. Here are a few samples of Marie's work; besides selling her own creations, she will do special orders, so just contact her at (435) 459-0767. Besides quilts, she does make carry bags, baby items, doll accessories and pillow tops. Now as I mentioned earlier, Marie Wigginton is a member of the Monticello Quilters Guild. The Guild meets the 4th Tuesday of each month, at 6pm, at the Monticello High School's Home Economics Room; new members are always welcomed. There is usually a "Sew and Tell" where members can show off their creations. Quilt vendors from the Four Corners (Arizona, Colorado, New Mexico and Utah) are encouraged to put on a "Trunk Show"; a display of fabrics, patterns, tools and accessories for the quilter. Occasionally a "Sew What?" is held; members bring in works in progress for tips and critiques. Marie Wigginton with fellow quilters, Jean Robinson and Carol Brewer. I hope to make it to their next meeting in October; all I know right now is that my quilter's box is peeking at me from out of the closet, and my fingers are itching to hold a needle again. As for today, meeting Marie Wigginton and her husband, Luther was a very enjoyable experience. Behind every happy quilter is a supportive, yet sleepy, husband; after spending time with this couple, I can say this is a statement of truth. Winter Sports in San Juan County, Utah? San Juan Skyway is Indeed a Scenic Byway.